Why Bok backline needs a big guy! Cape Town - Kurt Coleman's career has ticked along in Cape Town for eight years. 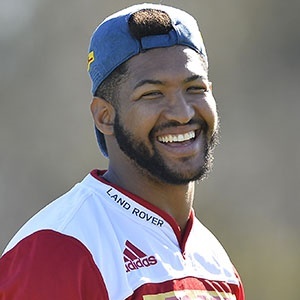 Having been a part of the youth structures at Newlands in 2009, the now-27-year-old earned himself a Super Rugby debut in 2011 and has been a part of the Stormers squad ever since. But with the likes of Peter Grant and Demetri Catrakilis consistently backed by Allister Coetzee, chances were few and far between for Coleman and he was never given an extended run in the No 10 jersey. When Coetzee and Catrakilis both left the franchise at the end of the 2015 season, Coleman would have thought that his shot was just around the corner. Instead, new coach Robbie Fleck has backed the young pairing of Robert du Preez and Jean-Luc du Plessis as his playmakers, and Coleman has again found himself on the outside looking in. Injuries haven't helped his cause, but even when fit Coleman has not been trusted with consistently leading the Stormers attack. The time was right for change, he says, and that is precisely why Coleman signed with Deon Davids and the Kings ahead of an exciting new venture into Europe and the PRO14. It brings to an end a long, yet frustrating stay at Newlands, but now Coleman has an opportunity to re-ignite his career. "It's a fresh start for me," he told Sport24 on Wednesday. "I think it's going to be good for my career just to do something new. "The thing that most excites me is playing against different players in different conditions and traveling to different countries, which is a first for South Africa. It's going to be exciting for most of the players in the Cheetahs and the Kings." The Cheetahs and the Kings are breaking new ground by joining the tournament that, up until now, has been known as the PRO12. Both franchises were dumped out of Super Rugby at the end of the 2017 season, and while they now have a future thanks to the PRO14, preparation has not been easy. The Kings lost a number of their players after Super Rugby, forcing Davids to start work with a new group that is still being bulked up with the start of the tournament just around the corner. "It's been a hectic two weeks trying to get to know all the players, the structures and the different calls," Coleman said. "We're all professionals so we have to get that down. It's about working hard to get ourselves ready. "It's a brand new group of players. Most of the guys who played Super Rugby are gone. Maybe that's a blessing in disguise because we're a brand new team and we can build our own identity." The Kings will open their account against away at the defending champion Scarlets on September 2 before traveling to Connacht in week two. It is difficult to know what to expect, from both the Kings and their opposition, given the fact that this is new territory for South Africa. "We don't know what they're going to bring. I think how you prepare for that is just to focus on yourself and do it to the best of your ability," Coleman said. "For now it's just to get up and running and get the first few games under the belt and then we can see from there where we stand and shift our goals a bit." If Coleman is given the No 10 jersey for that opening fixture, he will have big shoes to fill after Lionel Cronje dominated the position in Super Rugby this year. Under Cronje's leadership, the Kings played an enterprising brand of rugby all year and scored some fantastic tries in what was their best ever season in the competition. Coleman, though, understands that a high-paced, running game might not always be possible in the northern hemisphere. "It all depends on the conditions. If the opportunity is there, then we'll definitely have a go. We're not going to kick everything away ... we'll have a look," he said. "For them (European teams) coming here (South Africa) might be worse than us going there. "The guys who have played Super Rugby have played in cold conditions, especially in New Zealand, but they haven't been to South Africa in January when the heat is just banging down."